Oakland: University of California Press, 2018. 172 pp. $18.95. Maira, a professor of Asian American studies at the University of California, Davis, unabashedly advocates for the academic boycott of Israel. A member of the U.S. Campaign for the Academic and Cultural Boycott of Israel (USACBI) and wife of USACBI founding member and Bir Zeit University professor Magid Shihade, Maira's boycott, divestment, and sanctions (BDS) credentials are unimpeachable. She is thus perfectly suited to convey the history, preoccupations, and political challenges of the BDS movement. Her book also serves as a handy primer for its opponents. Maira displays the overheated rhetoric and biases fueling this illiberal movement. Impenetrable and numbing leftist jargon is ubiquitous. Her language rests on a foundation of "social justice," "anticolonial," and "intersectional" fixations, not to mention invented terms, such as "scholasticide" and "sociocide." 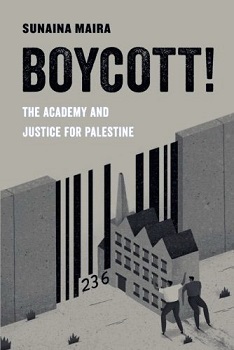 In her introduction, Maira writes that the academic boycott is a "social movement that is at the intersection of anti-war, human rights, and global justice organizing"; it is "increasingly embedded in antiracist, feminist, and queer movements." She is particularly concerned with "black" and "brown" alliances, bolstering her case with disparate forerunners including the opponents to South African apartheid, America's civil rights movement, the United Farm Workers strike of the 1960s, and today's Black Lives Matter. She lambasts Israel's defenders for their own outreach to minority groups, dismissing these efforts as a cynical engagement in "culture wars" and "black- and brownwashing." A laundry list of "redwashing," "pinkwashing," "greenwashing," and "STEMwashing" follows. Maira also dismisses allegations of anti-Semitism by citing such Jewish anti-Zionists as Hedy Epstein and Norman Finkelstein, but she is unsparing in her criticism of "liberal Zionists" such as Peter Beinart. Beyond "Zionist settler colonialism," "U.S. imperialism," and "neoliberalism," Maira's principle foe is the "Zionist backlash" that she acknowledges—without irony—has arisen in response to the predations of the BDS movement. Her typically conspiratorial view is based on a much-referenced 2015 report from the International Jewish Anti-Zionist Network that bizarrely places the Reut Institute, an Israeli think tank, at the center of a vast funding operation. Among those Maira alleges are connected to this web of influence is Daniel Pipes (whom she mischaracterizes as a "Zionist activist"), the Middle East Forum, and Campus Watch. Maira laments the stalled academic career of Steven Salaita, who found himself unemployed, not by Zionist machinations, but his own anti-Israel fanaticism and bad behavior. She fancies her fellow BDS acolytes in academe to be the targets, not of criticism or calls for accountability, but of "McCarthyism," "blacklisting," and "censorship." One wonders what Maira's publisher, the University of California Press, has to say about the latter. The truth is that the press's own promotion of leftist orthodoxy over scholarship demonstrates its complicity in limiting academic freedom to one side of the political spectrum. Not only are skewed perspectives like Maira's not censored, they are given an ever-widening platform to the exclusion of all others. Cinnamon Stillwell, "The Zionists Are Coming! Panic at San Francisco State U.," American Thinker, Oct. 7, 2017.